Morningstar Direct is planning to offer its clients important voting data. The firm recently published a preview of what I impolitely term ESG hypocrites – funds that advertise themselves as allowing us to invest in our values but then vote proxies against our values. 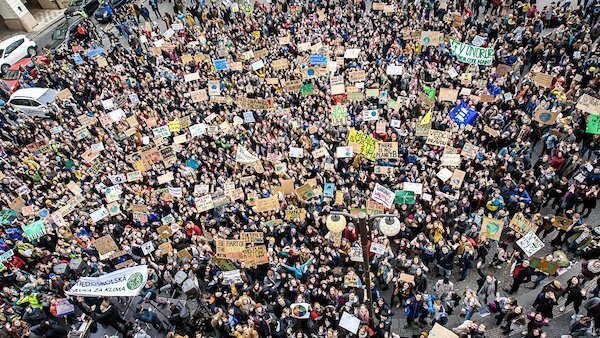 For example, last week, students around the world participated in a massive #ClimateStrike. Some have called it a tipping point. With BlackRock, Fidelity, TIAA-CREF and Vanguard all offering ESG funds to invest in our values, we must be heading for a low-carbon economy, right? That assessment may be premature. Not all ESG funds are alike. New Morningstar research – published for Morningstar Direct users – uses Morningstar’s Fund Votes database to examine how ESG funds voted during the 2018 proxy season on climate-related shareholder resolutions. The research reveals a striking difference in voting patterns from funds sponsors by ESG-specialists vs. ESG funds from more traditional, non-ESG fund companies. A huge positive is that more funds are starting to “get” the importance of ESG, not only as a screening tool for investing but also in casting proxy votes. Morningstar research found votes cast by the largest asset managers across all funds shows a year-on-year increase in support for all climate resolutions voted since 2016. That is certainly good news. Morningstar surveyed 14 resolutions with a positive vote of 40% or higher. Notice the two largest funds, BlackRock and Vanguard, with combined assets under management of $11.5 trillion, are laggards. Changing how they vote would make a significant difference. ESG funds from BlackRock, Vanguard, Fidelity Investments, and TIAA- CREF, among others, cast a number of votes that appear to conflict with an ESG mandate, especially for funds specifically aimed at the environment. 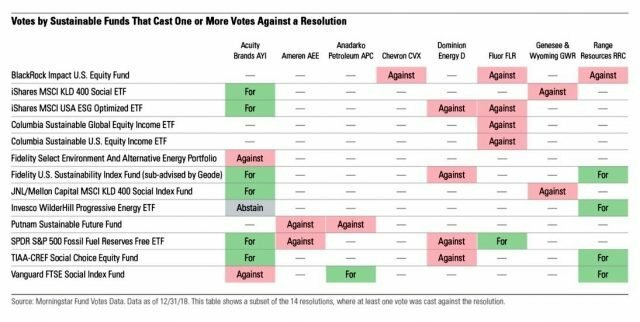 By way of contrast, among nine fund companies with an long-term ESG focus, not a single vote was cast against climate-change resolutions that garnered more than 40% of the shareholder vote. Asset managers with an ESG orientation unanimously voted for the 14 climate-related resolutions that garnered more than 40% of the shareholder vote across all funds managed. It also might be useful to look at underlying assets. For example, compare holdings of the Trillium P21 Global Equity Fund with BlackRock’s Impact US Equity Fund. BlackRock’s Impact fund contains investments in coal, oil and gas, fossil-fired utilities, etc. They constitute only a small portion of the portfolio but that is enough to get them 0 out of 5 “badges” from Fossil Free Funds. In contrast, Trillium P21 Global Equity Fund wins 5 out of 5 badges. Research based on Morningstar’s Fund Votes database will help Morningstar Direct clients differentiate ESG hype from ESG reality. The service is likely to increase demand for mainstream fund families to be more consistent in voting and investing within a transparent ESG framework. Traditional SRI funds have been investing and voting ESG concerns for decades. Some, like Calvert, Domini, Pax World, Praxis, and Trillium even announce their votes to the public before annual meetings. Do not expect that from mainstream ESG funds any time soon.